Lifetime Access to Lizatom's WordPress Plugins and Themes Club - only $37! Whether you're working on your own site or building one for a client, WordPress themes and plugins can make a world of difference. You can use various shortcodes and plugins to easily install everything from sliders to Google Maps. 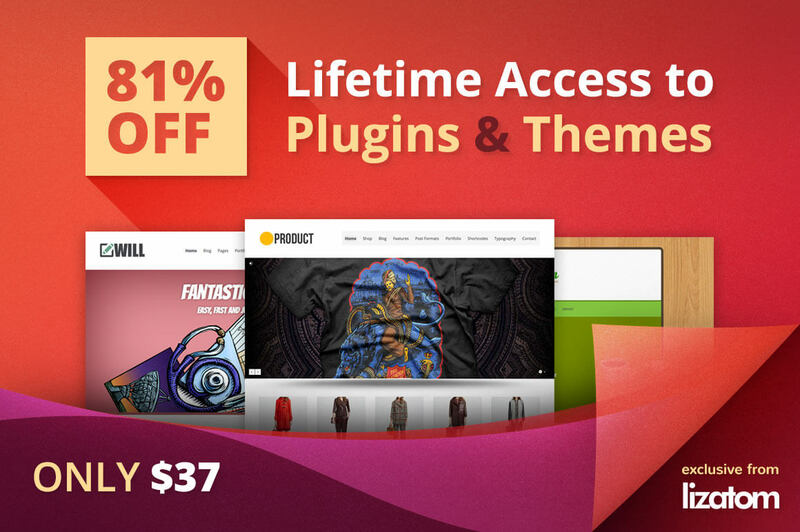 With this incredible Mighty Deal from Lizatom, you'll get yourself a lifetime membership to their amazing library of WordPress tools. That's full access to 20+ WordPress themes, plugins and even Shortcodes Master add-ons, all designed to turn average websites into fabulous ones. Get a lifetime access to all downloadable WordPress plugins and themes from Lizatom. Work with 20+ WordPress plugins, themes and Shortcodes Master add-ons that all can make your website look better and offer more exciting features. Impress your visitors with interactive plugins such as Google Maps, WooCommerce Products Slider, Animated Service Boxes, 3D Slider, and more. Dress up your website with popular and enticing WordPress themes that cover a variety of categories from products to responsive to gothic. No coding or programing necessary to take advantage of one of the biggest, most comprehensive responsive shortcodes set of plugins around. Easily customize any of these WordPress themes using the fabulous Themes' Options Panel, which even offers a live preview. Keep up to date year-round with updated files for themes and plugins. Get a lifetime of free support (including detailed documentation) with Lizatom, so there's no need to ever worry about being on your own! Create as many personal or client projects as you'd like using any of the plugins or themes included in your membership. The core plugin for WordPress shortcodes. Normally, a lifetime membership at Lizatom.com sells for $199, but for a limited time only, you can get full LIFETIME DEVELOPER ACCESS to all of Lizatom's current and future WordPress themes and plugins for only $37! That's a savings of 81% off the regular price. Click the BUY NOW button to start the club of a lifetime today! You will receive a coupon code, after completing your purchase, to redeem on the Lizatom.com website, to obtain your lifetime membership. All of the themes and plugins can be used for both personal and commercial projects, for yourself or your clients, on unlimited domains. You will receive lifetime developer access to all of the updates and all future downloads.